You could get married in the courthouse down the road…or you could go to Jamaica. Here are some of the best reasons to get married on the tropical Island of All Right. 1. There are more than a thousand churches to choose from. Apart from Vatican City, Jamaica has more churches per capita than any other country in the world. With around 1,600 churches dotted across the 146-mile-long island, if you’re looking to have a religious ceremony in Jamaica, there are plenty of options: Chapel wedding and reception on the beach? Totally possible. Getting hitched in a church ceremony in the misty Blue Mountains? Go for it. 2. But you don’t have to have a religious wedding. 3. You can go barefoot down the aisle. 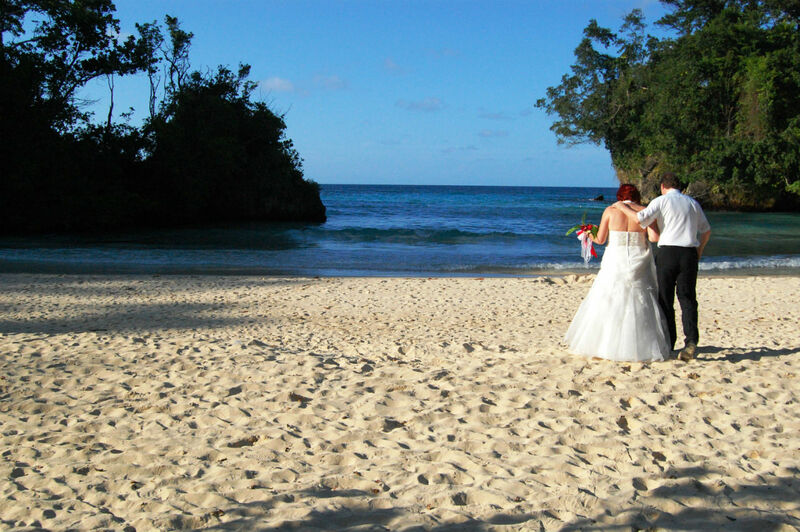 Tying the knot on the white sand of Montego Bay’s Cornwall Beach makes for the ultimate laid back and intimate wedding. Imagine walking barefoot down the “aisle” in northeast Jamaica, surrounded by friends and family on two acres of beach, everyone you love celebrating with you while the sun dips below the Caribbean. When Cornwall Beach — yes, the entire beach — gets rented out for weddings, an onsite wedding consultant helps arrange the marriage license, photographer, flowers, music, and wedding cake. That level of assistance is pretty typical of Jamaica weddings. 4. Eco-friendly nuptials are also a possibility. One of the world’s first hotels to be certified environmentally friendly, the multi-award-winning Hotel Mockingbird Hill sits between the Blue Mountains and the Caribbean in the tiny town of Port Antonio, on Jamaica’s northeast coast. Secluded and private, this is no mega-resort: There are just ten gorgeous rooms, one wedding a week, and an onsite wedding coordinator to help you plan your own bespoke ceremony. You don’t have to worry about the environmental impact of your big day, either. Hotel Mockingbird Hill counts its food miles, uses solar heating, participates in a carbon offsetting program…even the stationery in the guest rooms is made from recycled paper produced by a local women’s co-op. 5. Your guests most definitely won’t be bored. Weddings, even destination weddings, can be stressful — how do you keep friends and family with so many different interests entertained? You don’t need to worry about that in Jamaica. Your uncle who loves birding? He can seek out the local hummingbirds in Jamaica’s tropical gardens. Your foodie cousin will be more than impressed by the jerk centers dotted around the island, while your artsy best friend will love the culture scene in Kingston. And for everyone in your wedding party who digs the beach, they’re more than covered. 6. You can say your vows while you’re sky high. Getting married while flying through the treetops of Jamaica’s Mystic Mountain? Sure! Rainforest Adventures lets you say “I do” while riding in the Sky Explorer chair lift. If flying and getting hitched at the same time doesn’t appeal, they also offer a sky-high ceremony on the lawn atop Mystic Mountain. You’ll be at 700 feet to say your vows, meaning you’ll be able to see the Caribbean from the heart of the rainforest. 7. You won’t have to worry about language barriers. While many Jamaican locals speak to each other in Patois, the official language of the country is English, so communicating with the locals and vendors for your wedding won’t see any obstacles or confusion. 8. The perfect ceremony backdrop comes free of charge. Many brides spend thousands of dollars on the perfect ceremony backdrop. Archways, columns, rentals, flowers, and candles are all really romantic, but nothing compares to a priceless picture of the sunset splashed across the sky as you exchange rings. And it’s a background that costs nothing in Jamaica. 9. Jet lag won’t be a problem. Jamaica is an hour and a half by plane from Florida, making it an easy destination to reach. Even if you’re flying from as far as Seattle in the Northwest, it’s still only seven hours. Plan a layover in Miami and you’ll cut down the amount of continuous time on an airplane even further. 10. The weather’s consistently warm and tropical. With pleasant coastal weather ranging from 72°F to 88°F, Jamaica’s a popular destination year round. Peak season is mid-December to mid-April, with the rainier months between May and October. 11. If there’s a country that knows how to pull off destination weddings, it’s Jamaica. Sandals Montego Bay is said to have been the first place in the world to host a destination wedding. Whether or not that’s true, the original Sandals resort — and the seven others on the island — go all out for weddings. At the Montego Bay property, there’s a private beach, garden, gazebo, and an onsite wedding chapel, all available for your ceremony. 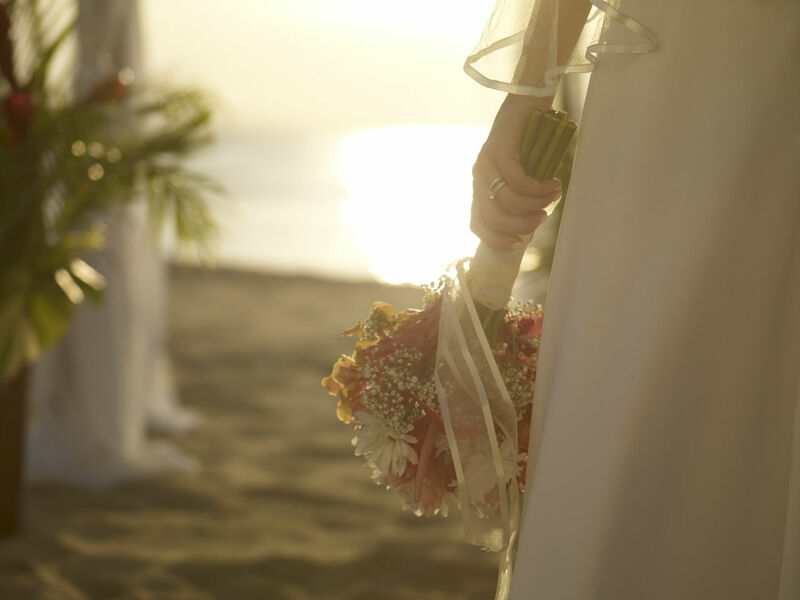 Most other large resorts also have in-house wedding coordinators to help you plan and customize every detail. And if you’re staying in a smaller resort, there are numerous local planners who can assist with your big day. You can have it right here in Jamaica. From climbing waterfalls hand in hand to dancing the night away to local jams, this island’s the ultimate romantic getaway. This post is proudly produced in partnership with Visit Jamaica.